During the summer here in the southern US, locally grown, freshly picked okra can be bought easily and inexpensively. It’s a popular ingredient and I’ve tried to adapt to it. 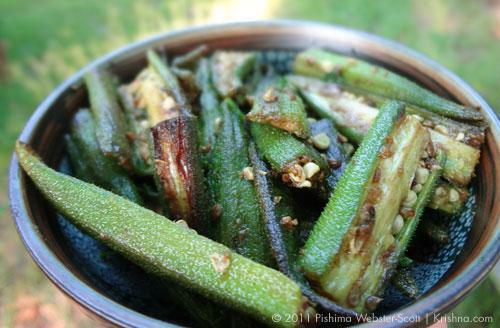 Until a few years ago, the only way I knew to prepare okra and avoid the slime was to deep fry the okra in oil or ghee. Fortunately, I found a healthier way to prepare okra, avoiding both the slime and the deep frying. To obtain minimal slime results, it is important to wash your okra and then fully dry it before cutting it with a knife. It seems that once water touches the insides of the okra the slime begins to multiply. Also, it is important to add the salt after the okra is cooked and not during the cooking the process for this particular dish. 1. Wash the okra and dry it thoroughly. Once fully dry cut off the top and slice in half length-wise and then in half again width-wise. 2. In a cast iron or non-stick frying pan heat the oil/ghee on medium/high heat until hot. Add the ground cumin, hing, turmeric and ground coriander and stir to mix. Be careful not to let the spices and oil get too hot or they will burn quickly at this stage. 3. Add all of the chopped okra and stir gently or toss to coat evenly in the oil-spice mixture. Cook for 10 minutes or so, stirring gently, until the okra is cooked through yet still bright green. It will just start to turn brown in some places. 4. Add salt and stir gently then remove from heat. Garnish with some cilantro when you transfer it to a serving dish if you like. This dish is easy to make and tasty to eat. I like to serve it with rice and dahl, and if I’m feeling particularly industrious I’ll also make chapatti. Submitted by Anonymous on Thu, 06/14/2012 - 16:14. Submitted by Anonymous on Sat, 10/08/2011 - 09:38.
i like the receipe of okra. Submitted by Anonymous on Thu, 09/29/2011 - 02:41. Bhindi is my favourite dish, especially the way my mum always prepares it. Cut them in rounds, and let it dry, then shallow fry them, seasoned with salt, the best ever way to enjoy this one. Another favourite, I've tried is pickled Okra with spicy filling. Submitted by Pishima on Mon, 10/10/2011 - 11:38. Submitted by Anonymous on Fri, 08/26/2011 - 04:04.
i like it,thank you very much for this.